Academics Management will provide your institution better expansion and helps in building efficient flow of process, it will lead your administration to the form of simplicity and assist in transforming into digitized structure than the usual tedious and manual admin work. Genius Education management allows the students to achieve the optimum results in their educational career, while managing and handling the day to day academic operational activities. It creates the right learning environment for the students which bring them one step closer to the success. Our Interactive web based ERP module is integrated with all the academic features of Education management with various learning and teaching tools that are focused on students result. 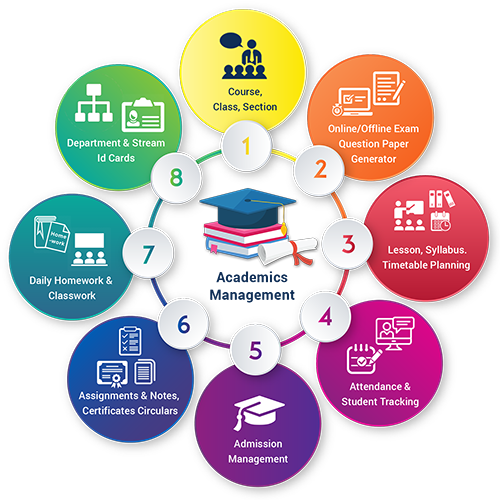 Students can perform better with the help of organized syllabus and lesson planning, that allows the easy communication between teachers, parents and students.It is designed to support the institutes for not only improvement in administrative workflows, but also to enhance the students at different stages of their learning journey. Teachers can check and view the list of classes and sections in which they are assigned to teach the students, they can see the Class number and the section in which they are assigned by either principal or by School Admin. Admin can add new class with class name, code and stream / department, it will also show the syllabus and student's strength of that class. Also he/she can add different sections for the particular class with total number of students studying in each section. They can also view and update the list of classes and sections of the students. Teachers can see the subjects allocated to them to teach the students from the list of Subject Allocation list, it will help the teachers to know the Stream/Department, and the subjects to teach in the different class and sections. The admin can add subject code for individual subjects and according to the government board rules, he/she can also add the book prefered to read and the author of the book for the same, For the different subjects admin can assign subject code like : Chemistry - CHEM, Physics - PHY, Fine Arts - FIAR etc. If the institute decides to add more subjects in the specific or all the classes, the admin can assign and add different subjects for the particular class and sections. Similarly, he/she can also allocate the different subjects to the teachers, which will help them in understanding about what subjects they need to teach in the lectures, with stream / department, employee name, class and section. Teachers / Admin can manage the syllabus of different subjects of the classes, this will help them to schedule the classes and lectures to complete the syllabus of different subjects on time. Admin can daily Add new planning list of the lessons, this will help the teachers to know the subjects, lecture code and their allocated different lecture topics, this will enhance the speed of completion of syllabus with timely manner. Similarly, Teachers can Add new planning list of the lessons daily, this will help the teachers to know the subjects, lecture code and their allocated different lecture topics, this will enhance the speed of completion of syllabus. Students can view their daily Assignments and Class Notes, which will be uploaded by their respective class teachers using the interactive Mobile App by their mobile phones. Teachers will upload the Assignments & Notes regularly in the system which can be viewed from Desktop web system as well as Mobile App. Students can view the class teacher's name who allocated assignments & Notes and the date of Submission of the same. Our interactive mobile app will help the teachers to Upload the daily class work / homework for their students. The students and parents can view the class work / homework assigned for every subject through Genius Education management Mobile app. This will help to those students who are absent on sick leave or any other reason. They can copy and complete their class work through the mobile app which will acknowledge the absent students about the day's class work and the given homework by their respective teachers. Admin can add different Certification name which are available in the Institute, he/she can add Certification type, and also can create new Customised certificate according to the Institutes available resources, the admin can also generate result certificates of each and every student, which will contain the certificate in the name of student, year of completion, certificate issue date, certificate type with the academic year of that certification period. The system Admin and teachers can add daily, weekly and monthly circulars if there is any events, picnic or educational visits, they will upload the circulars to the system and from their students can view the circulars of specific date with the mentioned latest circular. Students can check regular circulars if there is any events, picnic or educational visits, the teachers will upload the circulars to the system, they can view the circulars by customised date. The above features will help the institute to persuade the management with more controlled and convenient mode.